Is it that time of your career when you have to make the most important decision of choosing a path that can define the course for rest of your life? If you are thinking of a career in the fashion industry, there are few other career streams that offer you as many opportunities.The glam factor has always been a big pull into this industry but keeping the glitz and glamour aside it is also one of the most high paying career options. Making a break in this industry is never easy and requires a lot of hard work, exposure and skills. You need to go beyond the ordinary and make your mark. 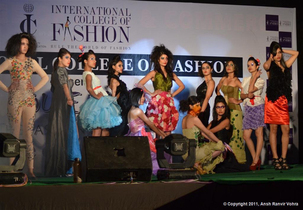 This is where it becomes important to choose a reputed fashion designing college in India. The fashion industry in India is coming of age and is expected to grow at a phenomenal rate in the next few years. More than 60% of India’s population is under the age of 35 and this makes it one of the most potent markets anywhere in the world. The young population in this country is more willing the ever to try out new outfits and style. Fashion in India was often thought to a feminine subject, but today we are increasingly seeing men take keen interest in clothes and accessories that they buy. It is however important for you to choose a reputed fashion designing college, one that offers you all the skills and knowledge you need to drive yourself forward in this competitive industry. The industry has moved much beyond clothing and apparel. We no longer live in an era where the same footwear was good enough for office going as well as social gathering. Indians have become much more fashion conscious and this has opened many new opportunities. Today there are many opportunities in designing footwear, accessories and jewelry. A fashion designing college would introduced you to the basic and advanced skills of designing, the use of right technology used in the production process and how to market the finished goods and procure raw materials. Fashion designing was considered to be an art for long and it truly is one of the best expressions of creativity. Today however it is a mix of art, modern technology and marketing skills. None of these are dispensable when it comes to creating a successful career. For instance if you have a good idea, it needs to be turned into a good product with the best use of technology. A good product would fail in a competitive market unless it is promoted brilliantly. The market has become very competitive in the last few years with hundreds of small and large brands looking to grab the customer’s attention. The advent of Internet has also opened up the filed for young designers and marketers. If you have the right product you can start off with your own label without much of capital.